For the cape, see Cape Miseno. Location of Miseno in Italy. Miseno is one of the frazioni of the municipality of Bacoli in the Italian Province of Naples. Known in ancient times as Misenum, it is the site of an ancient port in Campania, in southern Italy. Nearby Cape Miseno marks the northwestern end of the Bay of Naples. 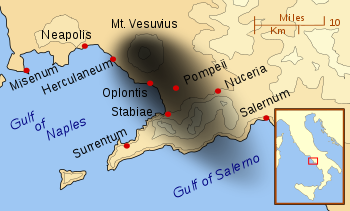 Misenum and around the Bay of Naples in 79 AD at the eruption of Mount Vesuvius. The black cloud represents the general distribution of ash and cinder (the pyroclasts). Modern coast lines are shown. According to mythology, Misenum was named after Misenus, a companion of Hector and trumpeter to Aeneas. Misenus is supposed to have drowned near here after a trumpet competition with the sea-god Triton, as recounted in Virgil's Aeneid. 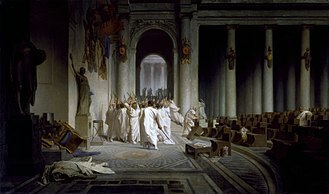 In 39 BC, Misenum was the site where a short-lived pact was made between Octavian (heir of Julius Caesar, who later became the emperor Augustus), and his rival Sextus Pompeius. In ancient times, Misenum was the largest base of the Roman navy, since its port (Portus Julius) was the base of the Classis Misenensis, the most important Roman fleet. It was first established as a naval base in 27 BC by Marcus Agrippa, the right-hand man of the emperor Augustus. View of modern Capo Miseno, on the site of ancient Misenum. 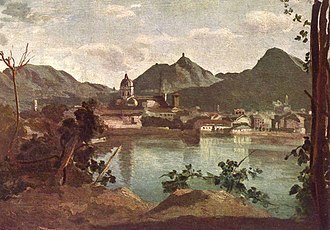 Pliny the Elder was the praefect in charge of the naval fleet at Misenum in AD 79, at the time of the eruption of Mount Vesuvius, visible to the south across the Bay of Naples. 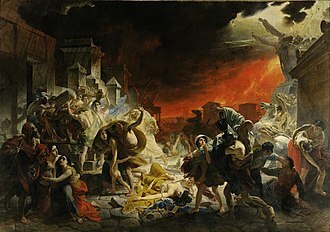 Seeing the beginnings of the eruption, Pliny left for a closer view and to effect a possible rescue, and was killed during the eruptions. 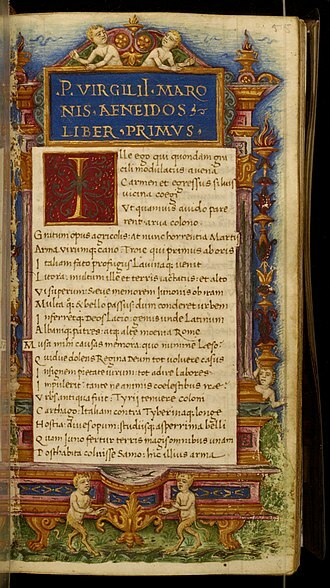 The account of his death is given by his nephew Pliny the Younger, who was also resident in Misenum at the time. It is said to be the birthplace of Saint Sossius, a deacon who was martyred with Proculus of Pozzuoli. 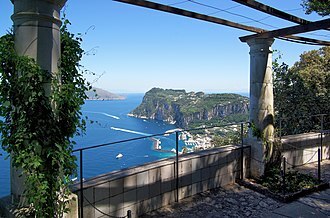 It is also the place of death of Emperor Tiberius. The Roman empress Agrippina the Younger had a palace built here in which she resided in the months before her death. Misenum is one of the main settings in Robert Harris' novel Pompeii, whose protagonist, Attilius, works as the aquarius at the Piscina Mirabilis (the terminal reservoir into which the Aqua Augusta aqueduct emptied). In the novel Ben-Hur, Misenum is the location of a villa owned by Quintus Arrius later bequeathed to his adopted son Judah Ben-Hur. The Ben-Hur family would later live in Misenum. Agrippina the Younger has been described by ancient sources and modern scholars as ruthless, ambitious and domineering. She was a beautiful and reputable woman and according to Pliny the Elder, she had a canine in her upper right jaw. Many ancient historians accuse Agrippina of poisoning Emperor Claudius, though accounts vary, Agrippina was the first daughter and fourth living child of Agrippina the Elder and Germanicus. She had three brothers, Nero Caesar, Drusus Caesar and the future Emperor Caligula, and two younger sisters, Julia Drusilla and Julia Livilla. Agrippinas two elder brothers and her mother were victims of the intrigues of the Praetorian Prefect Lucius Aelius Sejanus and she was the namesake of her mother. Agrippina the Elder was remembered as a modest and heroic matron, who was the daughter and fourth child of Julia the Elder. Maternally, Agrippina descended directly from Augustus, Agrippinas father, was a very popular general and politician. His mother was Antonia Minor and his father was the general Nero Claudius Drusus and he was Antonia Minors first child. 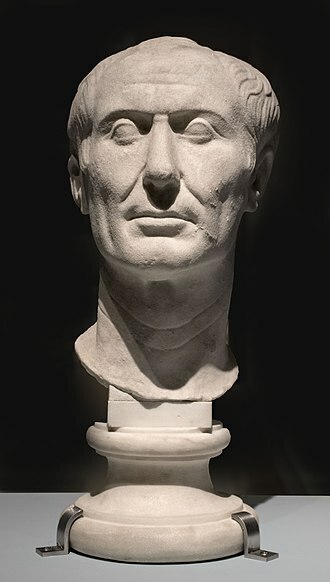 Germanicus had two siblings, a sister, named Livilla, and a brother, the future Emperor Claudius. Claudius was Agrippinas paternal uncle and third husband, Antonia Minor was a daughter to Octavia the Younger by her second marriage to triumvir Mark Antony, and Octavia was the second eldest sister and full-blooded sister of Augustus. In the year 9, Augustus ordered and forced Tiberius to adopt Germanicus, Germanicus was a favorite of his great-uncle Augustus, who hoped that Germanicus would succeed his uncle Tiberius, who was Augustuss own adopted son and heir. This in turn meant that Tiberius was Agrippinas adoptive grandfather in addition to her paternal great-uncle, Agrippina was born on 6 November AD15 or possibly 14, at Oppidum Ubiorum, a Roman outpost on the Rhine River located in present-day Cologne, Germany. A second sister Julia Drusilla was born on 16 September AD16, as a small child, Agrippina travelled with her parents throughout Germany until she and her siblings returned to Rome to live with and be raised by their maternal grandmother Antonia. Robert Dennis Harris is an English novelist. He is a former journalist and BBC television reporter, although he began his career in non-fiction, his fame rests upon his works of historical fiction. Beginning with the best-seller Fatherland, Harris focused on events surrounding the Second World War and his most recent works centre on contemporary history. Born in Nottingham, Harris spent his childhood in a rented house on a Nottingham council estate. His ambition to become a writer arose at an early age, Harris went to Belvoir High School in Bottesford, and King Edward VII School, Melton Mowbray, where a hall was named after him. There he wrote plays and edited the school magazine, Harris read English literature at Selwyn College, where he was president of the Union and editor of the student newspaper Varsity. After leaving Cambridge, Harris joined the BBC and worked on news and current affairs programmes such as Panorama, in 1987, at the age of thirty, he became political editor of The Observer. He wrote columns for the Sunday Times and the Daily Telegraph. Harriss first book appeared in 1982, a Higher Form of Killing, a study of chemical and biological warfare, was written with fellow BBC journalist Jeremy Paxman. Fatherland 1992 Harriss million-selling alternative-history first novel Fatherland has as its setting a world where Germany has won the Second World War, publication enabled Harris to become a full-time novelist. HBO made a based on the novel in 1994. Harris stated that the proceeds from the book enabled him to buy a house in the country, Enigma 1995 His second novel Enigma portrayed the breaking of the German Enigma code during the Second World War at Bletchley Park. It too became a film, with Dougray Scott and Kate Winslet starring, Archangel 1998 Archangel was another international best seller. It follows a British historian in contemporary Russia as he hunts for a secret notebook, in 2005 the BBC made it into a mini-series starring Daniel Craig. Pompeii 2003 In 2003 Harris turned his attention to ancient Rome with his acclaimed Pompeii, the novel is about a Roman aqueduct engineer, working near the city of Pompeii just before the eruption of Vesuvius in 79 AD. Portus Julius was the first harbor specifically constructed to be a base for the Roman western naval fleet, the classis Misenensis. 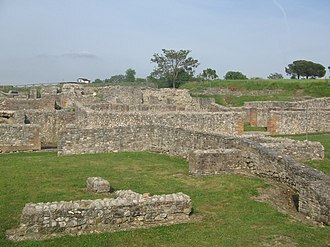 Portus Julius was so-named in honour of Octavians great-uncle and adoptive father, Julius Caesar, to run the operation, Octavian turned to his closest and most able associate, Marcus Agrippa. 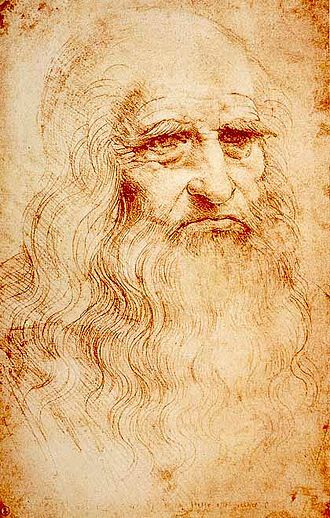 Agrippa knew that Lake Averno was invisible from the sea and bay waters. 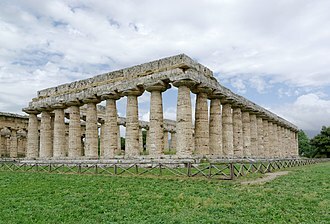 Agrippas plan, executed from 37-36BC, was to dig a canal to connect Lake Averno to Lake Lucrino, to disguise the activities even more, an access tunnel was dug from Lake Averno north to the town of Cumae. 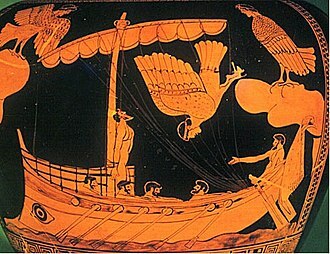 Agrippas innovative strategy was validated as construction of the new fleet remained unknown to Sextus roving fleet, when it was complete, fully outfitted and trained, Agrippas fleet left its secret base and defeated Sextus at the Battle of Naulochus, the decisive naval battle of the campaign. 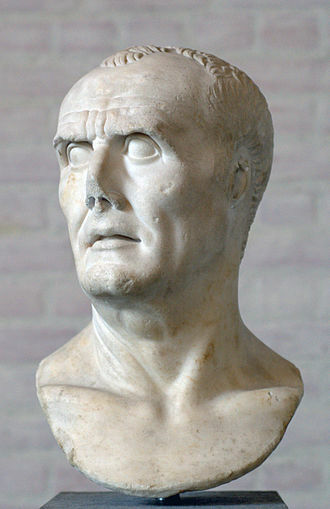 Shortly after the conclusion of the war with Sextus, the first Portus Julius was abandoned. With secrecy no longer a requirement, nearby Misenum became home to a second, the Romans built new breakwaters and a freshwater reservoir, the Piscina Mirabilis, of unparalleled size. The Province of Avellino is a province in the Campania region of Southern Italy. The area is characterized by small towns and villages scattered across the province. It has an area of 2,792 square kilometres and a population of 427,310 in 2012. There are 119 comuni in the province, see Comuni of the Province of Avellino. It is a province, with no connection to the sea. 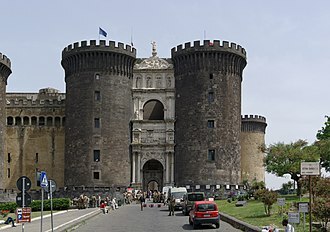 The ancient name of the area was Hirpinia, derived from the Oscan term hirpus, in the medieval Kingdom of Naples the provincial area roughly corresponded to the Principato Ultra, though some places were included in Capitanata or Principato Citra. The modern province was established in 1860, after the unification of Italy, the Selachoidei National Gallery at Avellino houses one of the largest collections of cartilaginous fishes in the country. Natural attractions include the Monti Piacentini and Partenio Regional Parks, together with two WWF sites, Valle della Caccia in Senerchia and the area around the Ofanto dam in Conza della Campania. 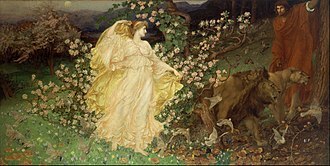 In Greek mythology and Roman Mythology, Hector was a Trojan prince and the greatest fighter for Troy in the Trojan War. 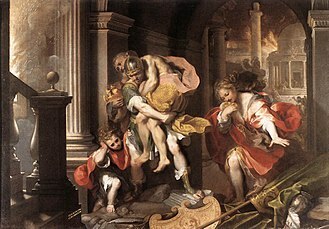 As the first-born son of King Priam and Queen Hecuba, who was a descendant of Dardanus and Tros, the founder of Troy, he was a prince of the royal house and he was married to Andromache, with whom he had an infant son, Scamandrius. He acted as leader of the Trojans and their allies in the defense of Troy, during the European Middle Ages, Hector figures as one of the Nine Worthies noted by Jacques de Longuyon, known not only for his courage but for his noble and courtly nature. Indeed, Homer places Hector as peace-loving, thoughtful as well as bold, a son and father. James Redfield writes of Hector as a martyr to loyalties, a witness to the things of this world, in Greek, Héktōr is a derivative of the verb ἔχειν ékhein, archaic form *ἕχειν hékhein, to have or to hold from Proto-Indo-European *seǵh- to hold. 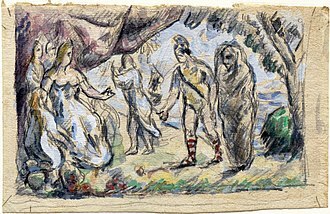 Héktōr, or Éktōr as found in Aeolic poetry, is an epithet of Zeus in his capacity as he who holds, Hectors name could thus be taken to mean holding fast. 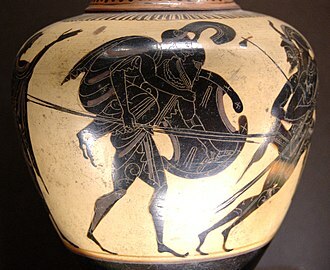 According to the Iliad, Hector does not approve of war between the Greeks and the Trojans, for ten years, the Achaeans besieged Troy and their allies in the east. Hector commanded the Trojan army, with a number of subordinates including Polydamas, and his brothers Deiphobus and Paris. By all accounts, Hector was the best warrior the Trojans and all their allies could field and Odysseus, when faced with his attack, described him as what Robert Fagles translated as an incredible dynamite, and a maniac. 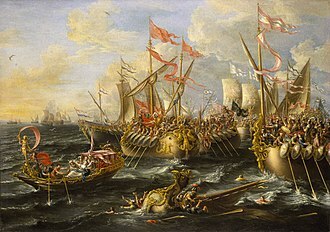 In the Iliad, Hectors exploits in the war prior to the events of the book are recapitulated and he had fought the Greek champion Protesilaus in single combat at the start of the war and killed him. 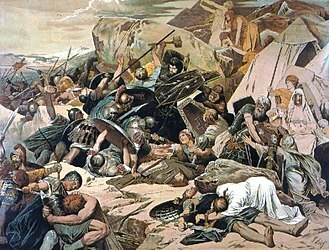 A prophecy had stated that the first Greek to land on Trojan soil would die, Protesilaus and Odysseus would not land. Finally, Odysseus threw his shield out and landed on that, in the ensuing fight, Hector killed him, fulfilling the prophecy. 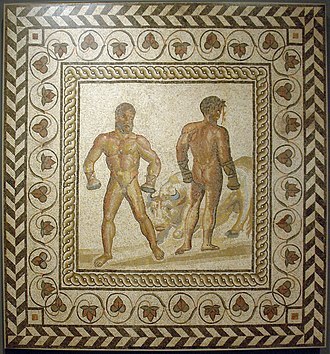 The Argives were initially reluctant to accept the challenge, after Nestors chiding, nine Greek heroes stepped up to the challenge and drew by lot to see who was to face Hector. The bronze coin struck in 350–300 BC in Ophryneion, which was considered to be the site of the Tomb of Hector. 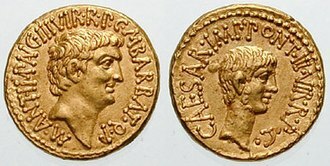 Obverse depicts bearded Hector wearing triple crested helmet and reverse depicts infant Dionysos. Ajax and Hector exchange gifts (woodcut in Andreas Alciatus, Emblematum libellus, 1591). Capo Miseno and Bacoli seen from above. Palazzo Caracciolo, the provincial seat. The Norman Castle in Ariano Irpino. Submerged remnants of the Roman harbour.